The 2017 Millbrook baseball team has will be led by 7 seniors – 3 returning starters – that finished in 2nd place in the CAP 8 a year ago. Senior pitcher Cole Leneschmidt will be the ace of the Wildcats pitching staff. The rest of the pitching staff is unestablished, but with lots of depth and quality arms coming up from the junior varsity team. Offensively, the Wildcats hope to be explosive. Look for offensive firepower from Tyler Snead, Greg Strickland, Dom Rodts, Will Gamble and Dennis Delgado. The non-conference early season schedule is as challenging as always, with the Wildcats facing traditional powers DH Conley, Pinecrest, New Bern, and Apex in the early season. The team kicked off its 2017 season with the annual Blue White Scrimmage on Saturday, February 18th in beautiful and unlikely warm, sunny weather. The Blue team dominated, winning 13-2 and giving Coach James his 2nd loss in a row in the annual scrimmage. The 2017 Wildcats will rely on a versatile pitching rotation, strong defense, and timely hitting in order to see success for the season. We hope to compete for the conference title and make another deep run in the state playoffs. Is it really almost time for our winter break? It seems like just yesterday that we were at the start of a new school year. Our PTSA has been very active and I’d like to say THANK YOU to all of you who have given so generously of your gifts, time and talents. Thank you to all of you who have joined the PTSA, and a special thank you to Jodi Bulmer and Nicole Truehart, our Membership Chairpersons for all their hard work. The PTSA is what connects our teachers, students and parents and makes our school strong. Our all-around support of staff, students and school leadership with grant money, technology and other programs helps ensure the school community has opportunities to grow and learn. It’s never too late to join! Please join us in making a difference in your child’s high school experience by encouraging other parents, grandparents, friends and family members to join the PTSA. New this year is our “No Fuss Fundraiser”, which involves donating to the PTSA without the hassle of selling anything. Our PTSA budget is approximately $25,000, and we cannot fund programs without donations from families. Forms can be found in the forms section of our PTSA website (http://mhsptsa.weebly.com/forms-fundraising--programs.html). Thank you to Kim Miller, our Passive Fundraising Chair for her continuous work organizing our Spirit Nights, Harris Teeter VIC program, and Kroger Plus Card programs. She also set us up with AmazonSmile. So as you are doing your online shopping for the holidays, don’t forget to use http://smile.amazon.com/ and choose Millbrook High School PTSA as your charity. The AmazonSmile Foundation will donate 0.5% of the purchase price from your eligible AmazonSmile purchases to our PTSA!! Thank you to our Hospitality Team of Renee Ward, Kim Day, Tanya Sloan, and Liz Miller, who coordinated a much appreciated Halloween staff luncheon. All the staff really appreciated the good food! Thank you also to our Character Education team of Karen Holman and Marlene Keeter, who coordinated a very nice breakfast in November for the students chosen by their teachers for exhibiting positive character traits. Thank you to Ginger Smith and Pamela Mundra our PAWS committee chairpersons for the October and November breakfasts to honor our 9th grade students chosen by their teachers for exhibiting our character trait of the month. Thank you to Cindy Potter for making sure our Wildcats in Need have a stocked pantry and for coordinating our Holiday Adopt a Family program. Thank you to Christy Burkey, our Newsletter editor. She has done a fantastic job of creating our newsletter and making sure everyone’s information is included! There are so many volunteers that help make all of our events a success and I can’t tell you how much your involvement and dedication is appreciated. THANK YOU to every one of you - these events could not take place or be successful without you!! And finally, thank you to the Executive Board – Kim Miller, Jodi Bulmer, Beth Billman, and Beth Black for all that they do for our PTSA! Without them I would be lost!! Our next meeting will be January 9th, 2017 at 7:00 PM in the Media Center. We’d love to see you there! I hope everyone has a very wonderful and restful holiday break. Thank you for your continued support! ​MHS Interior Design II class has been studying the different housing and architectural styles. ​During the holidays, they will be building gingerbread houses in class to depict some of the housing styles that they have learned. Everything on their gingerbread house will be edible except for the board their house is on. Not only will they "build" their house but they will have a yard and landscape. This ties in with the landscape unit that was covered in class. This will be Mrs. Chance's third year doing this project with her class and they always look forward to this project. The DECA Marketing Competitive Events Conference was held at the Raleigh Convention Center on November 30th. Ninety-eight Millbrook students competed and represented our school well! Students competed in their choice of events in the areas of Marketing and Hospitality & Tourism. The following students were recognized on stage for their accomplishments in their events. Medalists: Emma DeMartino, Sterling Adams, Ryan Rebne, Thomas Armstrong, Jackson Hall, Samuel Levine, Elizabeth Pickering, Austin Yeates, Brandon Cashwell, Ammon Thornton, David Flowers, Max Roberts, Jonathan Underkoffler, Linda Ward, John Adamkowski, Nolan Triolo, Noah Davison, Justin Miller, Grafton Potter, Isabelle Morgan, Jessica Tomlinson, Shaun Gillie and Lilly Hyde. The following students were finalists: Emma DeMartino, Thomas Armstrong, Jackson Hall, Justin Miller & Grafton Potter. Shaun Gillie & Lilly Hyde won 1st place in their event of Travel & Tourism Team Decision Making. DECA students will now focus on sharpening their skills and working on their written projects for the North Carolina Career Development Conference to be held in March in Greensboro. Millbrook's Men's Basketball team hopes to compete for their sixth straight Cap-8 Conference Championship this season. The Wildcats are already off to a 3-1 start behind strong play from seniors Jordan Whitfield, and Patrick Dorsey. Whitfield, who is signed to play collegiately at Campbell University, scored 24-points against Southern Durham in the team's second game of the season to guide the Wildcats to a HighSchoolOT.com Triangle Tip-Off Tournament Championship. Dorsey has been one of the most prolific three-point shooters in the state of North Carolina this season as he leads Millbrook with over 20-points scored per contest. Fellow seniors Chase Fowler, Gee Kalejaiye, and Landon Lee are expected to make big contributions as the season goes along, and junior Adrian Scarborough will also be counted on to log significant minutes for the Wildcats. Cap-8 Conference play starts on December 8th when Millbrook takes on Enloe High School. ​Millbrook's National Honor Society officers this year are President, Brandon Cashwell, Vice President, Darren Murphy, Secretary Lilly Triolo, and Treasurer, Carissa Petzold. The officers have been working hard this year to run our tutoring program in the media center on Tuesdays after school, the Teacher Help Thursdays, and various other projects around the school. The 2016 MHS Men's Soccer Season Concluded in the 3rd round of the NCHSAA playoffs in an Overtime loss to State Finalists Green Hope. The Wildcats won 19 matches, finished 2nd in Cap 8, made the playoffs and advanced to the third round. One player earned all state honors, 2 were named to the all region team, Seven players earned Cap 8 all conference honors and 21 of the 23 members earned academic all conference honors. ​Our team earned its first post-season birth in two years and won the most games in a season since the 2008 season. The soccer program graduates 14 outstanding seniors, 12 of whom played in the MHS soccer program for four seasons. Congratulations to the MHS players and staff on an amazing 2016 season. ​The Career and Technical Education Department is excited about this year and welcomes several new members to the Millbrook family. Mrs. Goblet has joined us at Millbrook as our newest Agriculture Teacher. She is currently teaching Horticulture I and all the Animal Science courses. She previously taught for ten years in Nash County and is thankful for the opportunity to teach closer to home! Mrs. Allen-Brodnax is one of our newest Millbrook Marketing teachers. She arrives from Vance County with four years of previous teaching experience. She is currently teaching Sports and Entertainment Marketing I & II, and Fashion Merchandising. She is excited to join the team and plans to not only educate our students but help guide them on their journey through and beyond high school. Mrs Clark comes to Millbrook from Johnston County with 13 years of teaching experience in Business. She is teaching Microsoft Word and Principles of Business & Finance. She was recently inducted into the CTE Business Teacher Hall of Fame and enjoys preparing her students for their future. Mrs. Simmons is delighted to be a new addition to the Millbrook Family and is looking forward to working closely with the CTE Department. Previously she was a Career Development Coordinator and a Business Education teacher. Mrs. Simmons will be CTE's Instructional Management Coordinator, helping our teachers in the classroom and coordinating testing for the department. Joining the Millbrook team this year teaching Foods I is Mr. Ed Manville. He has over 20+ years of teaching experience in the classroom and has served three schools in Wake County. He encourages his students to seek their "Natural Talents" and builds relationships to foster and encourage students at every level. Food is just a tool that is used to help students identify and reach their greatest potential. He is excited to join the amazingly talented group of educators at Millbrook High School aka "The Brook"
In addition, our Career and Technical Student Organizations have started the year with a bang. FFA, DECA, TSA & FCCLA have all had their first meetings and are working on getting ready for their first competitions of the year. HOSA (Future Health Professionals) is starting new this year and will have their first meeting soon. The National Technical Honor Society will also be new to Millbrook this year. Selected Career & Technical Education (CTE) students will have the opportunity to join the National Technical Honor Society. The National Technical Honor Society is an honor society for outstanding CTE students that meet certain criteria. The mission is to honor student achievement and leadership in Career & Technical education, promote educational excellence, award scholarships, and enhance career opportunities for the NTHS membership. Finally, The Millbrook Business Alliance is off to a great start as well. This group is a collaborative partnership between business leaders throughout the community and educators at Millbrook High School. The Business Alliance provides support and workplace realities for teachers and students. The career and life expertise of business leaders provides students with the relevancy between education and future careers. The Millbrook High School Business Alliance meets on a monthly basis to develop action steps towards meeting the goals aligned with the School Improvement Plan. There are many great opportunities for students being planned by this group for this year. ﻿Fine Arts Department is THRIVING! Select Visual Art Classes began the year with an activity called “Exquisite Corpse” a method by which images are collaboratively assembled. The technique was invented by the Surrealists as an old parlor game where participants would draw on a sheet of paper, fold it to conceal their part, and then pass it to another person for the next section of the drawing. In our activity, students were asked to contribute the head, body and tail of a creature, thus, our CRAZY CREATURES were born. Visual Art I students then revised their creations, gave them super powers and props and planned original storyboards which they brought to life through brief (and ridiculous) stop motion videos. SPARKcon is an annual arts festival featuring all ages and art forms in downtown Raleigh. It was an amazing weekend at Sparkcon this year. 20 Millbrook students participated in the Street Painting chalk festival. A group of Senior students, who had been competing since they were freshmen, won the "Best in Show" Award for their incredible portrait of Frida Khalo. The Millbrook Dance Company collaborated with local artist, Katie Gunter, to create an dance/visual art piece. Dancers improvised with pain on hands and feet on top of a canvas dance floor to create a piece of work that will be on display soon at Millbrook HS. Our Millbrook Marching Band has been working hard on their show since August 1st. Their show is entitled “The Music of Aaron Copland.” Our band performed at its first of five competitions this past Saturday at Panther Creek. Four competitions remain – Wakefield, Garner, Fuquay Varina, and Appalachian State University. You can see the Marching Wildcats at home football games during the half time show. The Millbrook Madrigals will perform at the North Carolina State Fair on October 13th as part of their first annual choral competition. The times have not been announced, but we will perform between 7-9pm in Dorton Arena. We would love your support! The Millbrook Performing Arts will be presenting Eklektikos on Oct. 6th with pre-show activities beginning at 6pm and the main stage event at 7pm. Eklektikos is a production that allows directors and students to explore unique performance styles and celebrate the creative diversity within the arts. Join us for a festival like atmosphere and exciting presentations as the Performing Arts once again brings their annual production of Eklektikos to Millbrook's stage. Spanish classes in the World Language Department will be engaging in activities related to Hispanic Heritage Month from September 15th through October 15th. This is a time when people recognize the contributions of Hispanic and Latino culture to the United States. 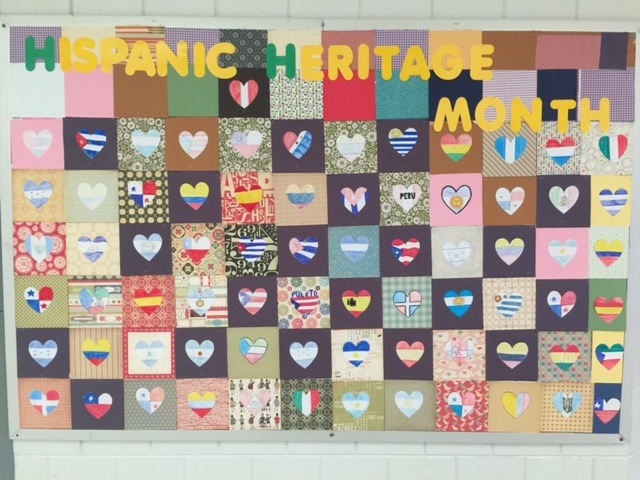 Be sure to check out the bulletin board in the 100 building that Mrs. Palmer’s Spanish classes made to honor and celebrate Spanish Speaking countries around the world. ​Volleyball 2016 has a mission and focus of “Commitment to Personal Excellence.” This team has committed to working hard and being disciplined in practices as well as setting personal goals for achievement each week. Weekly, the Varsity team is issuing player of the week and each match one player is selected for achievement in the focus of the week. Every girl brings hard work to the court every day. This is what then carries them through every tough match. We once again have some young members on the team with many of our team members in the IB program and taking heavy core classes. We are proud of their strong efforts to accomplish great things this season on and off the court. We are honored to have Seniors Morgan Fiorini, Macie Shoun and Sonia Wrobel (captains); Taylor Rebne, Izzy Regan, Taylor Clemmens and Josie Ansbacher round out the junior members. Arianna Rosario is our solo sophomore and we have three freshman—Skyler Rogerson, Patty Delmedico and Callahan Spessard. No matter what the position, everyone plays a role on our team. We look forward to a future of volleyball with our young JV Players, coached by George Tsai and both JV and Varsity is assisted by Coach Caitlin Davis. The girls thank her daily for her hard fitness and strength building workouts. JV players are: Sophomore captains Lexie Giglio, Katie Davidson and returner Emma Rosentreter as well as our new sophomore Tera Twitty. Freshman captain Morgan Pruchniewski is the floor captain followed by other freshmen Natasha Lang, Madison Clemmens, Amber Parker, Ella Pruchniewski, Emily Plummer, Jana Harrison, Kelly Schuetter, Ashley Dombrycz and Taylor Jones. We also thank our managers, who get physically fit every day helping out both our teams: They are Lead Manager Emma Maier, Casey Weidner , Hope Pruitt and Grace Cox. We also want to thank Evan Moesta who has single handedly increased our volleyball attendance because of his great promotions and features on Girls Volleyball—thank you Evan! Millbrook and the Science Department are happy to welcome two new science teachers: Scott Allen and Nick Scanlon. Mr. Allen is originally from Newport News, VA, and graduated from Virginia Tech. He came to Raleigh to work for GlaxoSmithKline as a medicinal chemist before deciding to transition into teaching. Scott is married and has two young children; he enjoys swimming, tennis and flying small planes when he has time. Mr. Scanlon grew up in Cary, NC and graduated from Appalachian State with a B.S. in Biology with a focus in Secondary Education. Outside of school he enjoys spending time with his wife and his dog, finding the best local restaurants in the area, and supporting his favorite sports teams (mainly the Carolina Hurricanes and Liverpool FC).